Twin Gables Guest House is a family-run business. Your hosts are Dawn, Scott and Travis Petersen. Mamre is historically a Moravian Mission Station, and is well known for its many national monuments. It has a rich history of missionaries that came from Germany to spread the Christian faith. It also served as an outpost for the British Military. Subsequently, many of the surviving buildings have been declared national monuments, including Die Langhuis, Church and the Old Mill. This village has a very close-knit community and is very very safe.We are very centrally located to the West Coast and Swartland Regions of Darling and Malmesbury. We also surrounded by a number of award-winning wine farms, including Cloof,Goote Post and Darling Wine Cellars. The West Coast Road(R27) is only 12kms away, the Industrial town of Atlantis 5kms away, and Ankerlig and Eskom 10 and 20 kms respectively.The Twin Gables Guest House offers you an escape from the hustle and bustle of the city life. Even though it is less than an hours drive from Cape Town(situated only 50 kms away), it provides all the peace and tranquility one would normally associate with the countryside. The balcony provides breathtaking views of unpolluted clear blue skies during the day and evening skies filled with brightly-lit celestial bodies which light up the whole village.Most of the guests are very pleasantly surprised once they have stepped into the house. It far exceeds what they would expect form a guest house, especially one situated in the relatively unknown village of Mamre. Wedding Venues: We can accommodate 40 to 50 people comfortably. Ideal for intimate wedding receptions, birthday celebrations and special events such as Valentine's Day. Guests can also sit outside at tables covered with umbrellas. Most catering supplies provided. Conference Venues: The Dinning Hall also doubles as a mini-conference centre. It can comfortably seat 25 up to 30 delegates. A Whiteboard, Projector, Flip-chart and Internet Connectivity are provided. Lunches and snacks can be arranged. 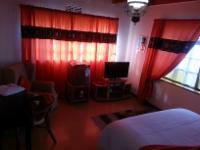 A deposit of 65% will secure your reservation. Cancellations made within 7 days of date of arrival forfeit the entire deposit. Cancellations made within 14 days of date of arrival forfeit 50% of the deposit. Cancellations made within 30 days of date of arrival forfeit 25% of the deposit. In the event of a... A deposit of 65% will secure your reservation. Refunds of deposits/prepayments for bookings are at the discretion of Twin Gables Management and are dependent on the ability to re-let the room/s. 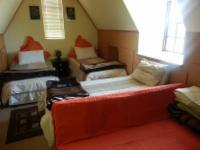 We enjoyed our stay at Twin Gables Guest House. Our kids enjoyed it too. We'll be back again, thank you! Enjoyed our stay. More than adequate facilities. Will visit again and recommend to others. Breakfast is definitely value for money. It beats the Spur & Wimpy breakfast offering. Twin Gables Guest House was a lovely surprise. I had to be in the area for a few days for work and this was the nearest accommodation. I was not expecting much from the tiny town of Mamre, but was pleasantly surprised by the warm and fastidious host, Travis, good beds, a generously proportioned guest house, and the possibility of good vegetarian food (not a regular strength of small South African towns!) I will definitely return when working in the area again. 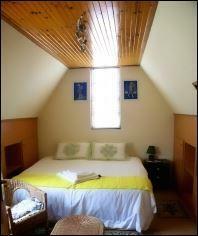 Twin Gables Guest House is 0.7km from the centre of Mamre , the nearest airport 52km (Cape Town International Airport).